This tale seems to be dragging on – whereas the journey itself did not – so I’ve decided to wrap up the last three days of the adventure in one post. 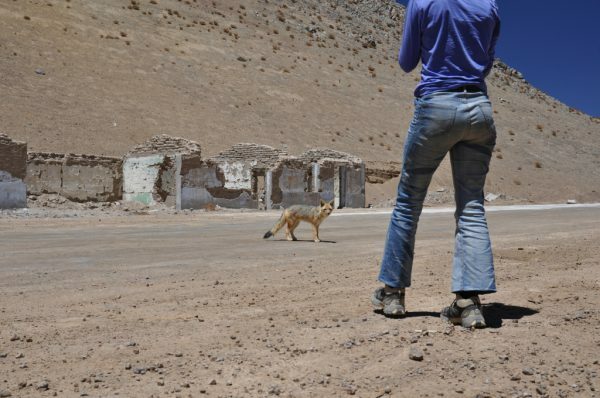 Having scurried across the Atacama desert, after one more night in the wilderness we made our way down towards coast. Our map showed a minor road running from a village called Caleta El Cobre (the Copper Cove) all the way down to a small town called Paposo – a distance of 45 nautical miles (90km) – and I pictured it running along the top of a cliff. We travelled towards this coast road on a surfaced byway (B-620) which quickly disintegrated into an unmade track. 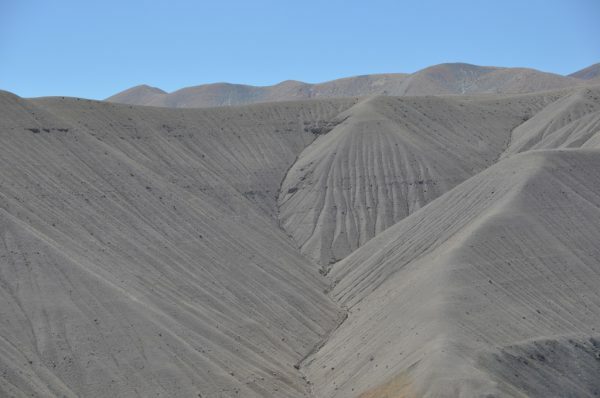 The track bounded down a ravine in the mountainside, twisting and turning like a snake. The map showed a short-cut which would cut the corner and save us 15 miles, but this turned out to be a private track leading only to a mine. Would-be visitors to this region might care to note that most of this road is coded green on the map, meaning that it is unsurfaced but packed down. 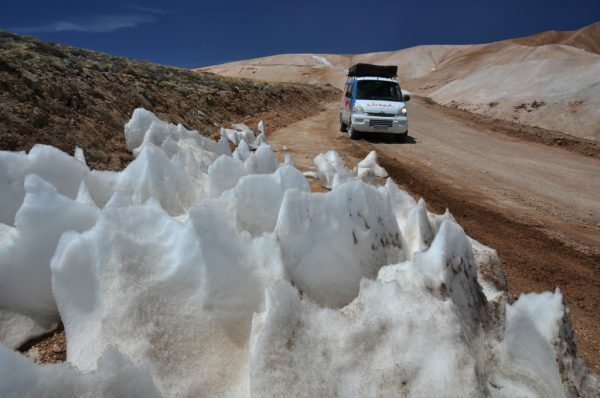 We had already discovered that most of the yellow roads were very rough and sometimes impassable to the campervan, and the white roads are only of use to a 4×4. I would not have particularly wanted to spend the night parked up alongside this little coast-road. There were numerous small, shabby settlements and isolated shacks along the way, and there were small groups of men fishing from the beaches and headlands. Outside each shack was parked a battered vehicle; and we saw no women or children. This gave the place a slightly dodgy, lawless feel. There was also no phone signal on this road – so if you do get stuck, these are the people you’re going to have to turn to for assistance. For all I know they may be the salt of the Earth. Maybe. 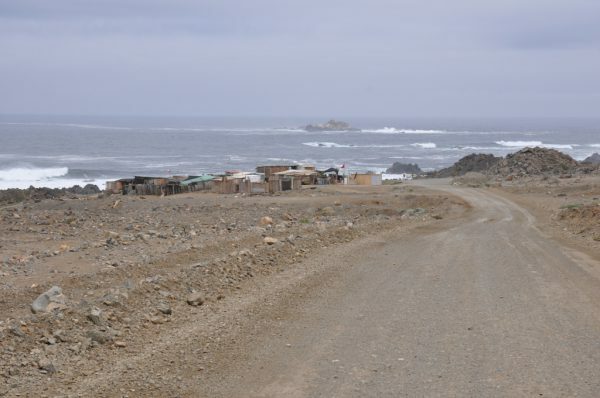 Eventually we reached the main thoroughfare, at Paposo (dismissed in my diary as “a dump”), and we followed this highway down the coast – through another scruffy town; past numerous roadside shrines; past piles of cannonball cactuses – into the Parque Nacional Pan de Azucar. People had told us great things about Pan de Azucar. All I will say is that we were not very impressed. It’s probably nicer in the summer – but then you would have to share the beaches and the valleys with crowds of other holidaymakers. I guess it could be that after decades of wandering the world and enjoying untouched isolated beaches we are spoilt. Mountains, on the other hand, are quite a novelty. We stopped in the park headquarters and dug up an old fellow, who gazed at us in bewilderment. “Where can we camp?” we asked him. He told us that the campsite was closed but that we could stop anywhere; this, despite notices forbidding wild camping. The only other people we met in the park were a couple of ancient fishermen, and both they and the old fellow aforementioned seemed to be stoned. Perhaps they’re making something interesting out of the cactus juice? We drove up a valley and parked the van and walked. 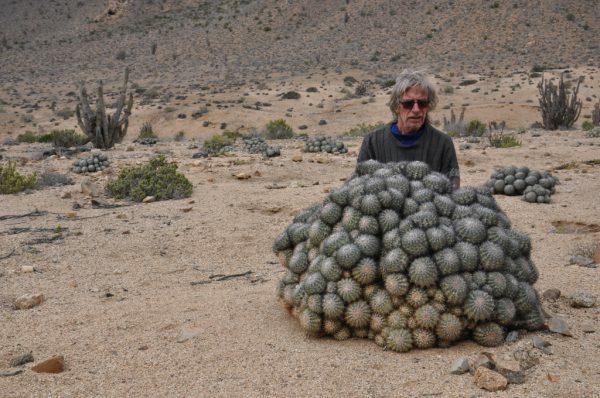 The scenery was unspectacular, but the number and variety of cactii was impressive. We spent the night in their vicinity. 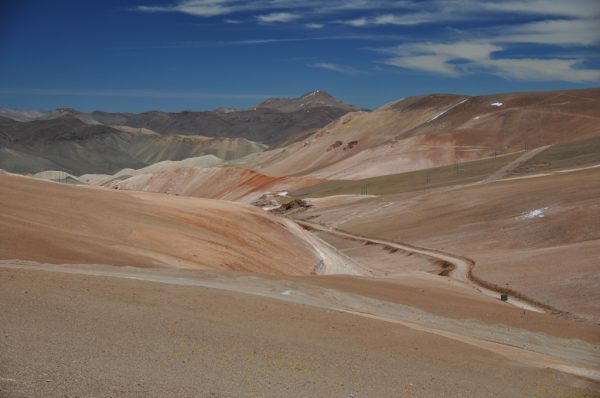 The eighth day of our whistle-stop tour saw us rushing back up into the Andes. You might ask why, if we wanted to be in the Andes, we didn’t just stay up there – but there isn’t a road running along amongst the peaks. In order to visit the different bits, and the different parks, you have to keep coming back down to the coast and then heading inland again up another valley. 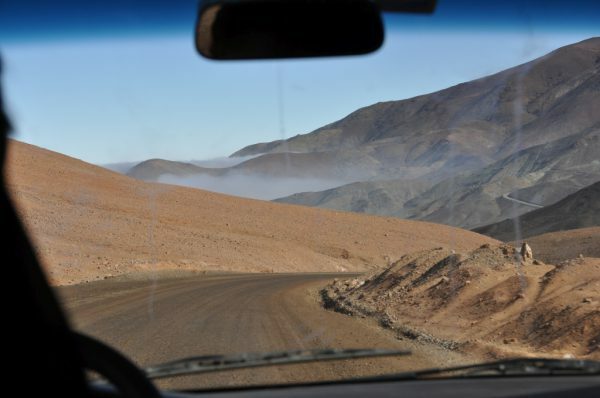 This time we were heading for the Parque Nacional Nevado Tres Cruces, and we followed the road which ascends the notorious poisoned valley above the town of Chañaral. Although it is utterly bereft of life – perhaps because of the toxins, or perhaps on account of the climate – the valley leading up to the copper mine at El Salvador is still very spectacular; and in fact, this journey aloft and the road which we subsequently took to travel down from the park were by far the most exciting and dramatic of our ten day expedition. These valleys are evidently sometimes swept by flash-floods deriving either from snow-melt or from thunderstorms in the mountains above. 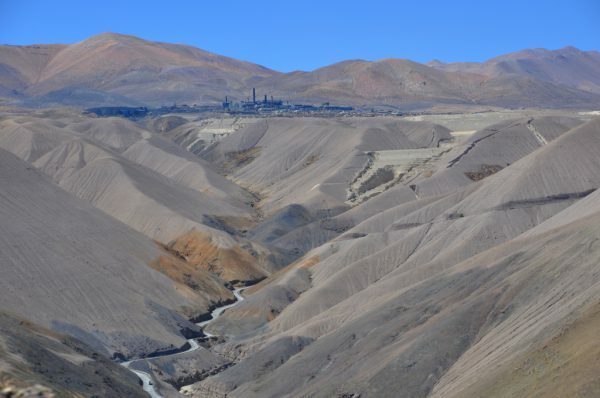 In the one leading up from Chañaral there lies the remains of a railway line, whose track is now torn asunder and twisted; and in both valleys the road is perched atop a low bank and descends to cross dry fords. In places we noticed the remains of an earlier bank, which had been carried away. It’s clear that the road is only kept open through diligent effort. Why would the government go to all that trouble when absolutely no one lives up there? We had topped up the fuel tank in a small, grubby town (Diego de Almargo) which sits at the foot of the valley, and our intention was to top it up again in the settlement of Potterillos. This little place was shown on our maps as lying just a few miles off the main track, near the head of the valley, at the end of a wiggly road; and it was shown as having a COPEC fuel station. 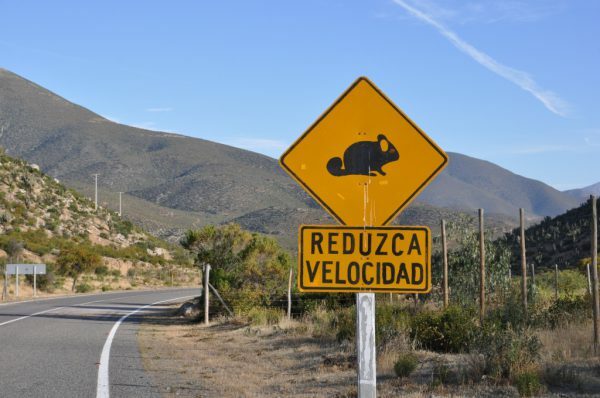 Of course, when we arrived we discovered that the road wiggles because it’s ascending the side of the valley… (duh!) – and having scrambled to the top we found that the ‘village’ is actually a mine. And there was no fuel station. This was the second time that the otherwise excellent COPEC maps let us down rather badly (the previous one being the non-existent short cut, mentioned above). Having wasted three litres of precious fuel ascending the valleyside we now had to come straight back down again, via that same road. As we negotiated its hairpin bends we gazed across at the opposite side of the valley, where a truck was inching its way up an even more precarious road. We could almost see the sand falling away from the slopes beneath its wheels as the lorry ascended. But on regaining the valley floor, and having investigated the road which continues towards the head, we realised that our 2×4 campervan was not capable of continuing by that route; so up the slippery valleyside we jolly well had to go. As we ascended, the dry heat was replaced by an icy breeze; but the most striking thing was the absolute silence. There were no human traces, apart from the rough and ready roads, and there were no birds or animals. 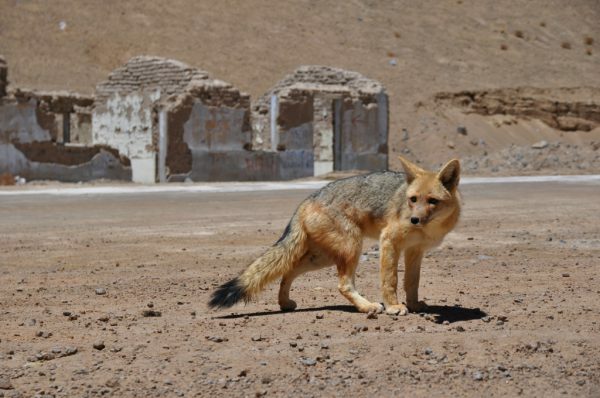 And then we came upon a ruined house and, close to it, met a fox! 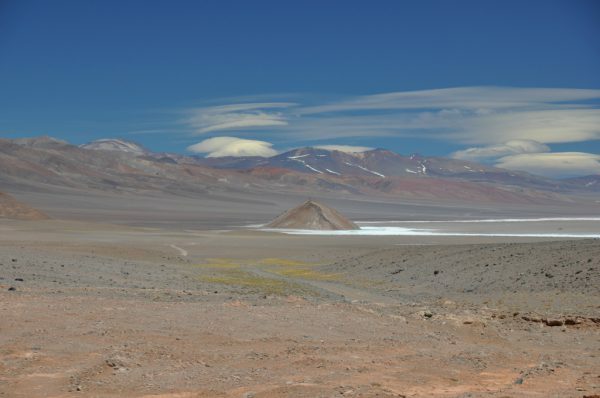 After ascending and wiggling our way along for a couple of hours, at 3,600m we found a flat tableland not wholly unlike the one which shelters the Atacama salt pan. And, here, too, there was a salt pan, albeit a somewhat skinnier one (Salar de Pedernales). 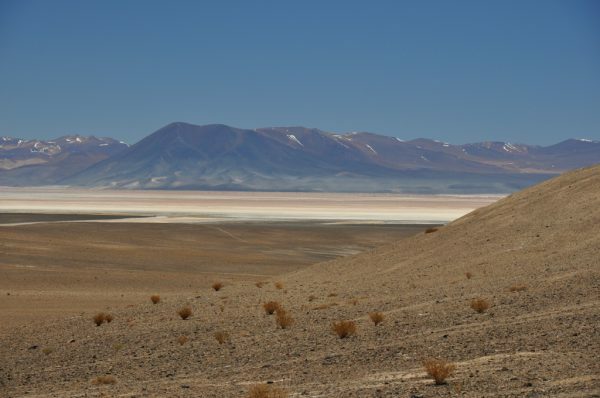 This mesa is higher and therefore wetter than the Atacama – it receives some snow-melt – and parts of the pan were therefore glistening in the sun; but in other places the wind sent dust devils swirling over the silent landscape. 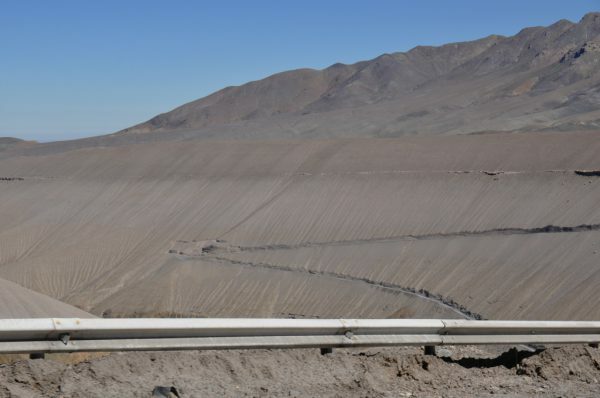 Eventually we came to a border-control checkpoint – and this was something of a surprise since the frontier was still some 110km away and we had no intention of crossing into Argentina. A man came out to tell us that the frontier was closed because there was too much snow; but when he heard that we were only going to the national park he lifted the barrier and let us through. For the past few hours we’d been following a dirt track road, but now, in honour of international relations, it was replaced with a superb asphalt one. 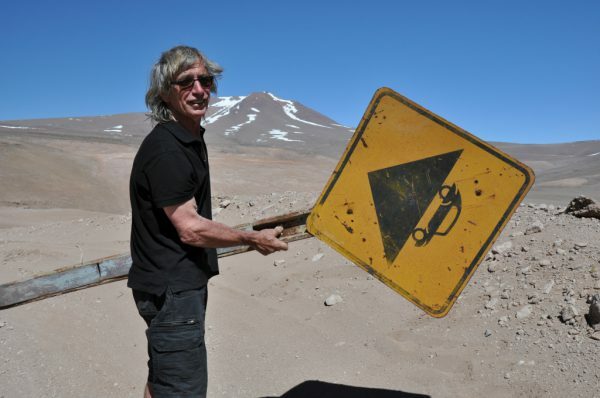 This stretch of tarmac presumably continues to the point where the no-man’s-land becomes Argentinian territory (and then, I have no doubt, it reverts to a rutted track), but we did not have the opportunity to enjoy it. Just a few hundred yards beyond the frontera buildings we turned off into the Parque Nevada Tres Cruces, and the road promptly disintegrated into the worst that we had used in our entire journey. Note to other would-be visitors: This is the easy way into the park. We were subsequently advised that our vehicle was not capable of managing the track which runs out the other side (C-601); in fact, the park rangers laughed at the mere idea. Moreover, it should be noted that this entire network of roads is generally impassable in the winter. 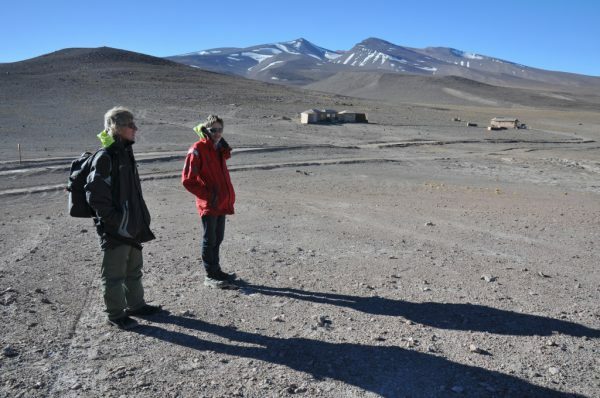 We eventually reached the three sheds – overlooking the Salar Maricunga and Laguna Santa Rosa – which are the most obvious visible presence relating to the park authority. One is home to a resident warden, another accomodates scientists studying the region, and the third is called the hotel. For 40,000 pesos per person (about $63 US / £46 / 52 E) visitors can pass the night in the shabby, unheated hotel. (No shower, no running water, and a baler system for the loo. This is because the ground is almost permanently frozen.) The fee for pitching a tent on the stony, sloping ground is also rather steep (15,000 pesos p/p) but, happily, we were able to persuade the warden that our roof-top tent was integral to the van, and so he only charged us for the park entry (10,000 pesos each). In return for your money, you get a splendid view of the lake and the surrounding snow-capped mountains, and you can peer through your binoculars at a flock of flamingoes. Visitors are no longer permitted to walk along the shore and get close to them. 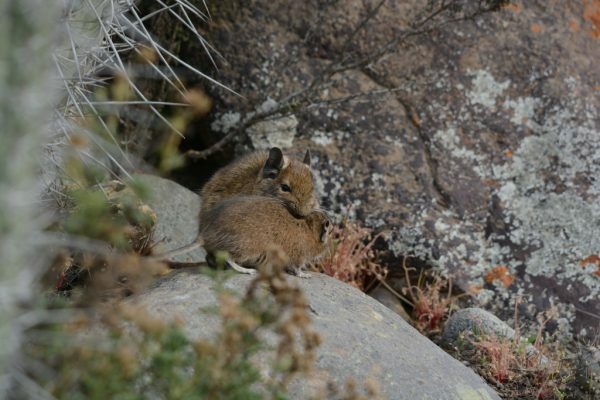 Seemingly, in all the years that they have been breeding here, the birds have never actually managed to hatch a chick, and the naturalists believe that this might be because the presence of people disturbs them. The theory is that the birds are frightened away from their nests, leaving the eggs to get cold. It will be very interesting to follow this experiment and see whether, with the help of the new policy, the birds manage to raise any chicks. If they don’t, then evidently there must be some other factor at work. 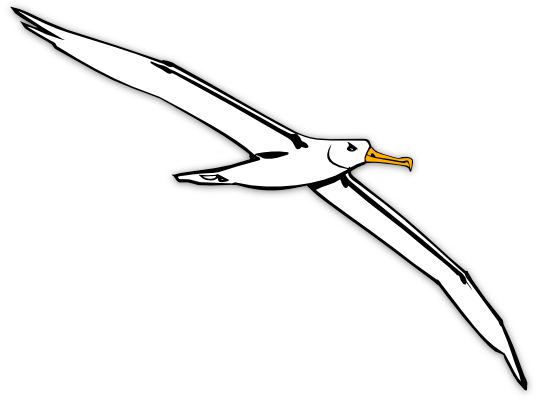 Solving the mystery is of considerable importance, if not in the overall scheme of things then certainly for ornithologists, and for the Chilean ecosystem, because these birds are an endangered species. 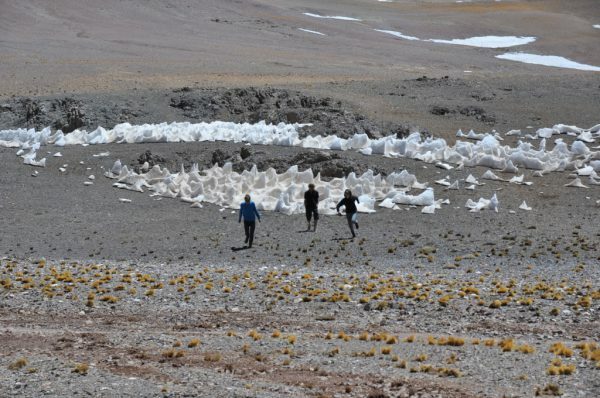 Although we were camping at an altitude of 3,800m, this time we suffered no major ill-effects. Our bodies had evidently adjusted – to the extent that we had felt very energised when we were walking down by the seashore in Pan de Azucar! It is true that, on our return to the alto plano, I still felt very sluggish and rather breathless, but Roxanne even managed to run (in order to sneak up on another fox) and none of us felt headachey or sick. Just as we turned in for the night, at dusk, the warden started his generator; and then he went for a walk, leaving the machine running and his lights on and his wide-screen TV showing a film. 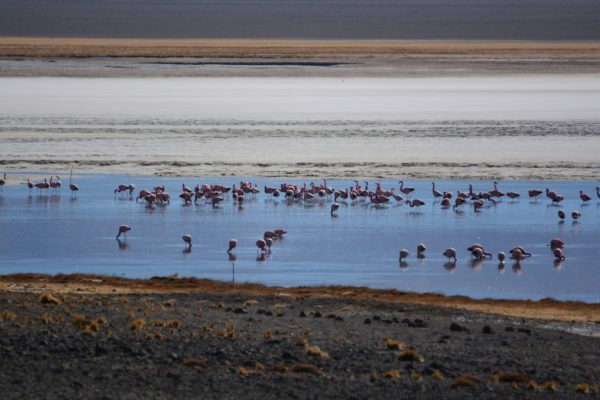 Personally, I believe that this kind of wanton living is as big a threat to the survival of the flamingoes as that of allowing people to wander within a hundred metres. 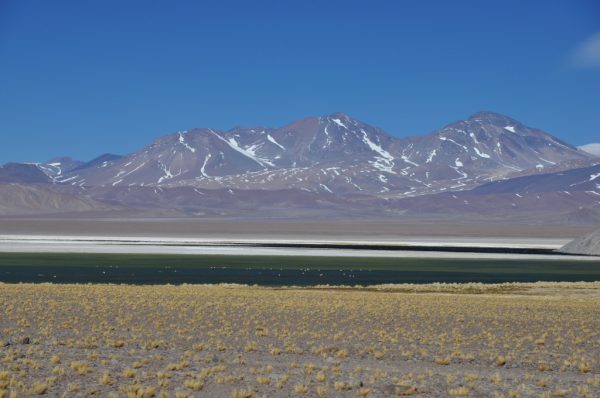 We had hoped to spend the next day visiting a lake (Laguna Verde) close to the border, and there was even talk of ambling a little way up the world’s tallest active volcano – Ojos del Salado (6,893m). However, upon consideration of the matter we realised that this detour might leave us without enough fuel to get back down the mountainside; and so, accordingly, we set off on the return journey. The landscape that we passed through on our descent from the highlands was even more dramatic than that of the previous day, partly because there was still snow lying around but mostly on account of the colours. The further we managed to make it along that road, the further we would have to go back if it became impassable. And if we had to turn around and we ran out of fuel… then what? Down in the lower reaches, the valley was unspeakably arid and very hot; and higher up it was very cold but just as arid. I began to worry as to whether we were carrying enough water in the event of a breakdown. We had passed no other vehicles, and at times like this I am haunted by a terrible story told to us long ago by a man who ran out of fuel while driving in Morocco. As a result of the breakdown, his wife and children died of thirst. I’m a great one for worrying… and, as usual, the worry was unnecessary. 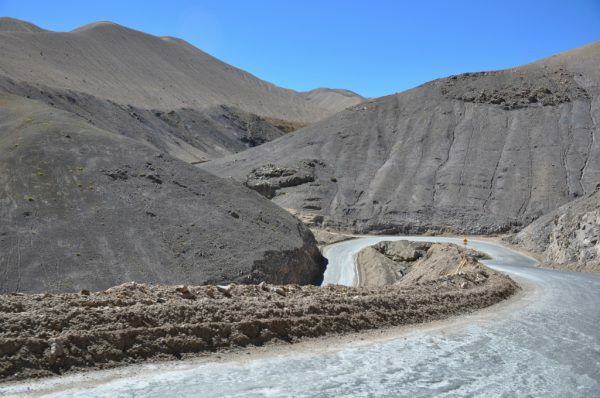 The road proved passable all throughout its length – if only barely, in one particular place – and we eventually tumbled out onto the main highway. 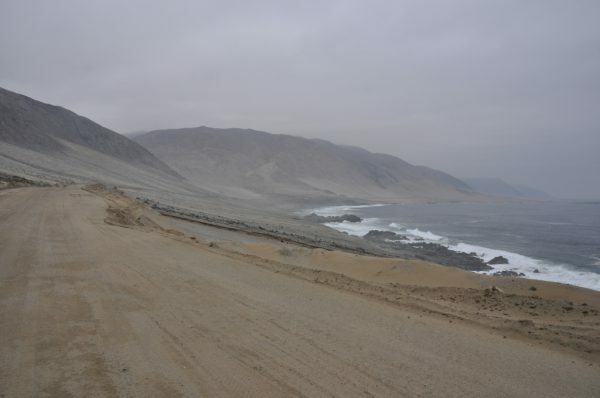 We still had enough fuel left to get us to the nearest COPEC, in the oasis town of Copiapo. We spent that night nowhere in particular, on a coast road which runs between shabby seaside villages. To judge from the appearance of these resorts, anyone who wants to can come along and throw up a chip-board shack to use as a holiday chalet. Chilean houses tend, in any case, to be built from chipboard – so I guess it’s only foreign tourists who consider the result to be an eyesore. By now we were leaving the desert; and for the penultimate day of our journey we wandered a little way inland, through valleys whose slopes were covered with cactii but whose floors were well watered. An endless chain of small horticultural farmsteads occupied the narrow flood plain, and there were vineyards and orange groves, and the road wound through villages and small towns. 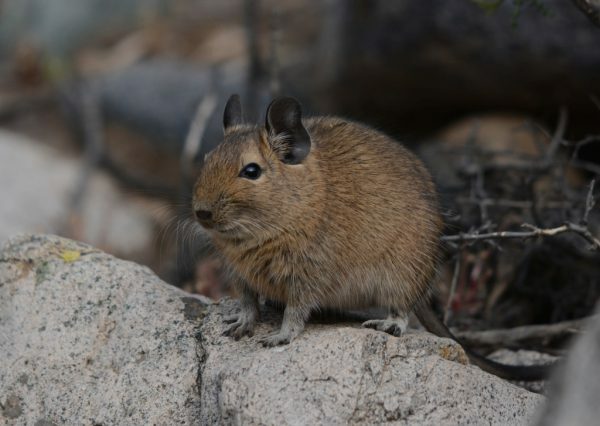 We were aiming for the Parque Nacional Chinchilla, and hoping to arrive before dark. This we achieved – but, alas, the park had closed half an hour earlier. We stopped at a bar-come-cornershop. “Where can we see chinchillas?” I asked the barista-come-salesgirl. This was disappointing but not unexpected. We turned up a small road which branched away, opposite the shop, intent now on finding a place to park for the night. I soon identified a suitable seeming spot, at the side of the lane leading to another copper mine. We pulled over and bundled out; and immediately we noticed little tracks running hither, thither all over the ground. “Shut-up and listen!” hissed Roxanne. And in the bushes nearby we heard an anxious chattering and a lot of rustling. It transpired that we had inadvertently parked in the centre of Chinchilla city. Either the shopkeeper never leaves her shack, or else she was being protective of the little furballs – and with justification, since they are endangered. Chinchillas are said to come out only at dawn and dusk, but the following morning this lot failed to materialise for our dawn patrol, only emerging from their bunks at about ten. They were far too numerous to count, and they seemed to be rather too carefree for their own good. Besides ourselves there was also a plump fox ambling about in the valley, and i’ll bet I know what he eats for breakfast, dinner, and tea. 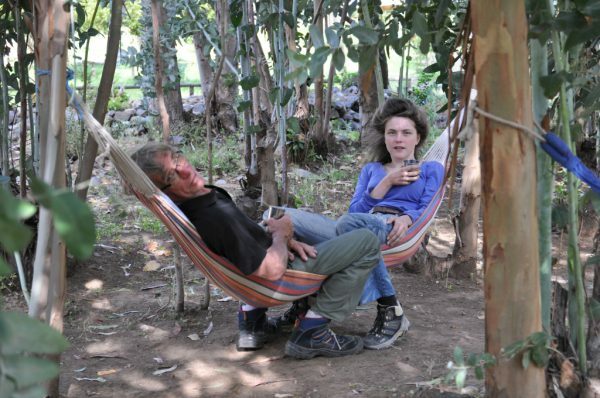 The Rincon Nativo campsite is run by a young couple, Claudio and Pilar, on the land where Claudio grew up. In fact, his parents still grow food on the other half of the plot. The eucalyptus trees and the lemon grove were not remotely nativo… but the ambience was good and there was lots of birdlife. If you’re looking for a quiet and leafy corner to stop, in the vicinity of the big city, we recommend it. On the morrow we folded the tent down for the last time and took the vehicle back to Wicked Campers – and this would be a good place to summarise our opinion of that company and their vans. 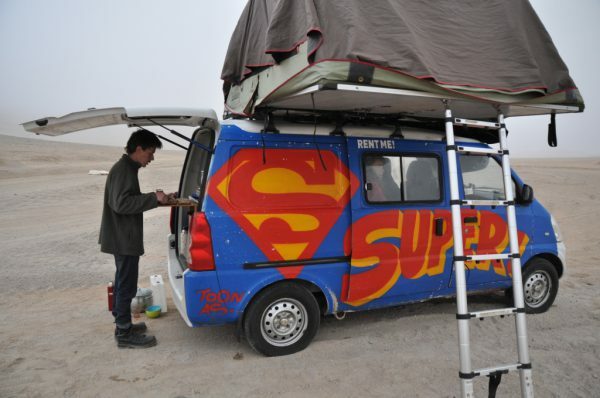 If you do an on-line search for campervans you’ll almost certainly find that Wicked come out cheapest. We’ve since found another company whose 3-berth vans are slightly cheaper, but the van that we hired was half the price of any other 4-berth van that we could find in Chile. There’s a reason for this: Wicked vans are Chinese imports, poorly made and poorly fitted out. Provided you aren’t going to crash the van (and I’m told that, in this event they fall apart) the worst thing about these cheap vans is the seats. The front seats are merely so-so, but the back-seat is the most uncomfortable that you will ever sit on. The metal frame isn’t even covered in foam, never mind sprung! We resolved this problem by spreading our sleeping bags along the back seat and putting coats on top of that. The next worst thing is the noise. Gawd, the noise!!! The van rattles and howls along the road, and it is certainly not possible for anyone in the back to conduct a normal conversation with someone in the front. This makes any journey tiring (but we found that motorway travel is the noisiest and therefore the worst). The rattling is slightly alleviated if you carefully wrap and stow the cutlery and crockery and pad the folding chairs, which stow in a box behind the back-seat. The best thing about the van is the fold-out bed, in the tent. The fact that it folds out is a major inconvenience – one would always rather be sleeping inside the van, so that one can park up anywhere – but the mattress… now that is deluxe! We always slept well. 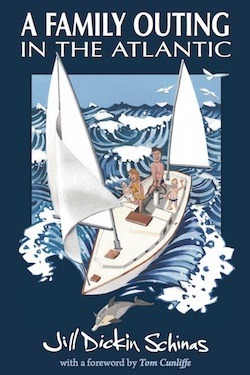 The tent is also good, although the flysheet is difficult to set up; and if not properly set up it flaps like a badly set sail in the slightest breeze. There is ample room for four adults to sprawl about. The van actually seats five, and I reckon one could easily cram a fifth person into the tent. The final niggle concerns the paint scheme. I’m all for smothering the van in artwork – and after all, I painted our VW kombi with life-sized mermaids – but driving around in a van badly gratified with a super-sized image of Superwoman is… Well, basically, it’s just naff. We hear that vans hired in Australia are also emblazoned with rude slogans and even with vile racist and sexist remarks. The company chairman apparently feels that this brash approach gains him customers, but I’ve read of cases where the people hiring the van were so embarrassed that they painted out the offensive words. 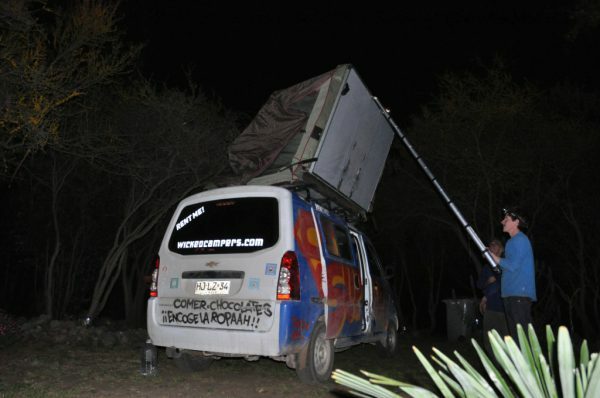 For the Chilean market, the wicked remarks have been toned down, and our van merely bore the words, “Eating chocolate makes your clothes shrink”. Even so, I felt the need to point out, to everyone that we met, that we didn’t pen that idiotic remark ourselves. My closing suggestion is that if you’re going to hire a camper for more than about a month, then you might just as well buy one instead – because it would be cheaper. But for heaven’s sake don’t do what we did: Don’t buy a 20 year old minibus. Rather – buy a new pile of Chinese rubbish, the same as the Wicked van. 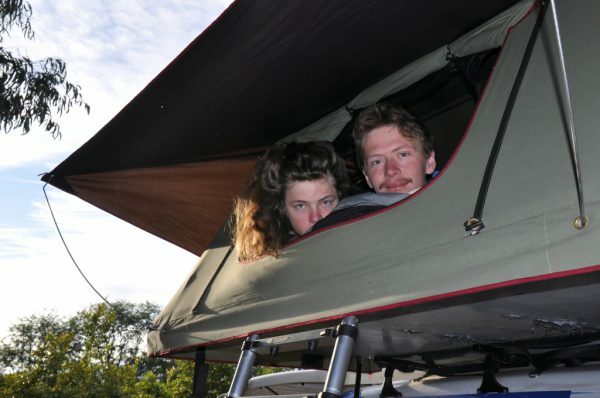 Some fellow yotties did this, and they’re still driving the van, and cruising the boat in tandem, more than a year later! I just send u a message on FB.